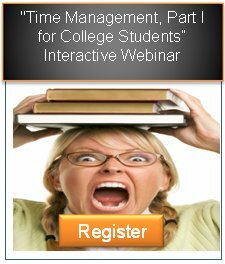 Register for the Time Management , Part I for College Students Webinar! "Time Management, Part I for College Students"
"Time Management, Part I for College Students" features a live speaker who will help students manage their time more effectively by providing them with the tools needed to succeed in this fast-paced driven world. You will be able to ask questions during the webinar and get one-on-one advice about how to improve your time management skills. All webinars are confidential. For this webinar, you will need an Internet connection and speakers to hear the audio. Pre-registration is required to join the webinar. You should pay for the webinar and reserve your space by selecting one of our payment providers, Eventbrite or PayPal, on the Registration Payment Page. Also, before the webinar, you will be given a link to the page to access the webinar as well as other information. If you need to cancel or reschedule or have questions or comments regarding our interactive webinars, please contact us at webinars@elitelifeskills.com. $25; includes 37.5% discount for college students. Enter Code "COLLEGE14." To verify your status as a student, you must either use your college e-mail address or verify college enrollment (for example, student ID, etc. ).